Faced with a steady rise in cases and filings related to elder abuse, many California courts are developing ways to accommodate seniors and bring together community partners and resources so as to more comprehensively address the needs of abused and neglected elders. Elders today are more active, independent, and living longer than ever before. However, as our population ages, the elderly become more susceptible to the hidden problems of elder abuse, neglect, mistreatment, and exploitation. Elder abuse and neglect caseloads are increasing in the courts. What can our courts do to help? Several courts in California have implemented promising practices specifically designed to address this population, which also include the application of collaborative justice principles. These courts develop expertise on a broad spectrum of issues specific to the elderly. Collaboration with local agencies and resources are often sought so as to provide a more comprehensive approach to the application of justice. The Center for Families, Children & the Courts staff who directly support the Collaborative Justice Advisory Committee to the Judicial Council, works closely with local courts to promote the implementation and expansion of such efforts. If you have any questions or comments regarding Elder Courts, these can be directed to collaborativejustice@jud.ca.gov. The Center for Families, Children & the Courts, with support from the Archstone Foundation has explored how courts can effectively respond to cases involving elder abuse. 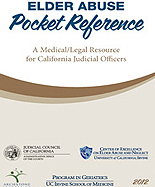 Beginning in 2010 and into 2011, the Judicial Council provided funding and organizational support to conduct three trainings in the San Francisco Bay area, central, and southern California. Hosted by Contra Costa, Fresno, and Ventura Superior Courts, surrounding jurisdictions were invited to attend and participate. These day long trainings were well attended and provided a comprehensive examination of issues related to creating such courts including the importance of understanding the needs of the elderly. A basic introduction to elder abuse, its dynamics, and special considerations for the court in handling elder abuse cases.